UPDATED: Toshiba adds cloud services, auto-calibration and more to TVs, plans glasses-free launch next year | What Hi-Fi? Toshiba's gathered the European press to roll out its plans for this year's products and give us an idea where it's going next. The legendary Cinecitta film studios is certainly an auspicious venue, but Toshiba's done its level best to compete with the location by promising a raft of products more advanced than the company has ever delivered before. There’s certainly plenty to get us sitting up and paying attention where Toshiba’s new TV technology is concerned. The company’s chip technology and new CEVO engine means that its 2011 screens will variously feature automated picture calibration via a very serious-looking probe, 800Hz motion processing, both passive and active 3D technologies, and screens that recognise your face when you sit in front of them. What’s more, Toshiba is extremely bullish about glasses-free 3D – the company says high-quality 3D is on the cards in less than twelve months. There are five new TV ranges. 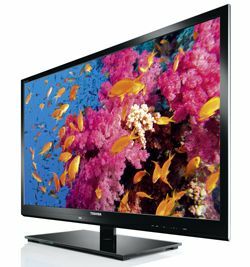 The SL (above) and UL series are 2D TVs, available in screen sizes from 32” to 46”. It goes without saying that they’re both 1080p ranges, and both feature Freeview HD reception and a suite of on-line features the company’s calling Toshiba Places. Toshiba Places is a cloud-based portal allowing users to access and share content across a range of Toshiba products like TVs, laptops and tablets. If we say iPlayer, YouTube, ConFM internet radio, social networking and an online app store, for instance, you’ll know exactly the sort of thing Toshiba Places is intended to be. Both SL and UL series feature Personal TV – a suite of up to four memory presets of volume, picture setting, recorded programmes and favourite channels. In addition, the UL series includes face recognition – take a seat in front of the screen and the TV automatically calls up your Personal TV settings. Leave your seat and the screen will automatically switch to standby. The UL series is also the first range to feature the new Auto Calibration feature: a USB-connected sensor transmits data to an internal image processor, allowing the screen to calibrate its picture settings and gamma curve to their optimal. It’s also equipped to allow USB recording to an external hard drive. The VL series (above) is the first of Toshiba’s 2011 3D range, and it’s the only range to feature ‘passive’, polarised technology – it’s also the only one of Toshiba’s 3D ranges to features four pairs of 3D glasses at no extra cost. Available in just two screen sizes (42” and 47”), it’s got all of the specification goodies (LED backlighting, Freeview HD, Toshiba Places with its on-demand services, Auto Calibration and Personal TV presets) of its 2D siblings plus wireless LAN via an optional dongle. Move up the range (and loosen the purse-strings yet further) and the WL and YL (pictured left) ranges (42”, 46” and 55”) bring active shutter 3D technology and Jacob Jensen design to the 2011 platform. Hybrid LED backlighting with local dimming zones (‘cluster’ zones, according to the nice man from Toshiba Japan), a claimed contrast ratio of 7000000:1, built-in wifi and 2D-to-3D conversion with depth control are among the other highlights – in addition to all the innovations the lesser screens in the range are packing, of course. These screens are also the first fruit of Toshiba’s just-announced tie-in with Yamaha. Anything that applies itself to the underwhelming sound most flatscreens make is to be welcomed, so it’ll be just as interesting to hear the new Toshibas in action as it will be to see them. Toshiba’s 2011 range of Blu-ray players consists of just two machines. The entry-level BDX1200 is a 2D player, and as well as Blu-ray and DVD discs it’s able to handle DivX, MKV, MP3 and JPEG files. It’s also compatible with BD Live 2.0. The BDX3200 adds 3D playback and on-board decoding of Dolby TrueHD soundtracks of up to 7.1 channels. Like Toshiba’s 2011 range of TVs, prices for these two new players are yet to be confirmed, and we can expect to see them in the UK before the summer’s out. Finally, there's a range of notebook computers offering 3D Blu-ray playback. The new Satellite P 755 (above) uses a 15.6in Toshiba TruBrite HD 3D display panel and comes bundled with a pair of NVIDIA 3D Vision active glasses; both it and the P750 also feature 2D-to-3D conversion. Also available are the 17.3in-screen P770 and P775 models, and all the new notebooks have Dolby Advanced Audio and Harmon/Kardon stereo speakers.